In April 2014 my husband and I decided to vacation in France. We spent a few days in Paris, visited with some friends in Normandy and then boated up the Rhône and Saone in the Buri, owned by Viking River Cruises. Being able to speak the language of the host country added to my pleasure. 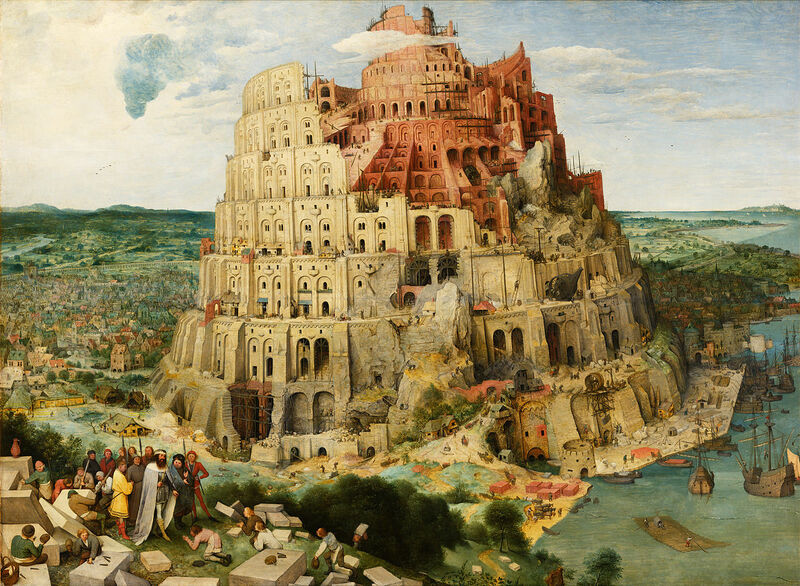 The Tower of Babel as depicted by Flemish Renaissance painter Pieter Bruegel the Elder. I owe my three languages to history. German is the language of my childhood; French that of my adolescence and young adulthood; and English that of my life ever since. Each one of my tongues is associated with a different me. By now English is my dominant language. It was with English that my future husband won my heart; it was in English that we raised our children; and it is English-speaking America that provided me with permanent shelter, citizenship and the opportunity to earn a decent living. Nevertheless it is French that I love best. When I step off the plane in a French-speaking country, my heart beats a bit faster; it is as if the sun came out from behind the clouds. Between trips my French gets rusty and I hate listening to the way the guttural r’s roll off my tongue. During that recent vacation trip I was surprised how rapidly French returned to my mental forefront and how readily my brain supplied me with words I had not used in decades. Soon I had to stop to ascertain whether I was speaking or reading French or English. I feel very different about my German. My family had lived in Germany for centuries, the men having fought in its army, many dying in its wars. When I came along, however, my alleged compatriots mercilessly persecuted their Jews. I grew to hate and fear everything German, including the language and even the parts of myself that smacked of my family’s Teutonic past. After living through the Nazi occupation of Belgium from 1940-44, I even became physically afraid whenever I found myself in a German-speaking environment. Very, very occasionally the words of a poem or song will connect to my soul. The effect my languages have on my personality may derive from the circumstances during which I acquired them. I learned French when I wanted desperately to be accepted by my peers. I fell in love with the rhythm and the poetry of the language and subscribed to the pride the French take in their tongue. I took pride in being taken for a native. I arrived in New York at twenty-one with a rudimentary knowledge in English, good enough to attend Columbia University’s School of General Studies, where I eked out the required B average to enter graduate school. Within a year I made English my own, but the fact that I had left French-speaking Belgium reluctantly and among other things, had yet to learn another language, made me resentful. Growing up with more than one language is mostly a good thing, but it permanently segments a person’s inner self. When I was younger, there were times that I wished that I had a single mother tongue. I always had an accent, and even today people feel entitled to ask me where I am from. When I embarked on a writing career, a well-meaning neighbor wondered aloud whether this was presumptuous, since I was not a native-born American. On the other hand, learning a language as natives do, is usually accompanied by an instinctive understanding of another culture and the ability to view problems from multiple angles. If I were given a choice I would opt for being polyglot–though, given the political and economic necessities of the world, those who are, seldom have options. This entry was posted in Uncategorized and tagged belgium, columbia university, family stories, first language, german jews, hidden children, holocaust, immigrants, immigration, immigration stories, jewish history, judaism, languages, multilingual, multilingualism, nazi germany, new york city, polyglot, second language, third language, viking river cruises, world war ii, writing. Bookmark the permalink. Thank you for writing about languages. I’ve been writing about belonging and being part of a community – they are related. I learned Igbo, my husband’s language, and it certainly strengthened my feeling at home in Nigeria. I learned German, my father’s language, in college, not from him. I learned bits of Portugal from living there for a few months I am still eager to learn French proficiently!